The circular economy is one of the biggest industrial trends identified by the World Economic Forum. What does the circular economy concept actually mean and how can local business prepare for the threats and opportunities it presents? 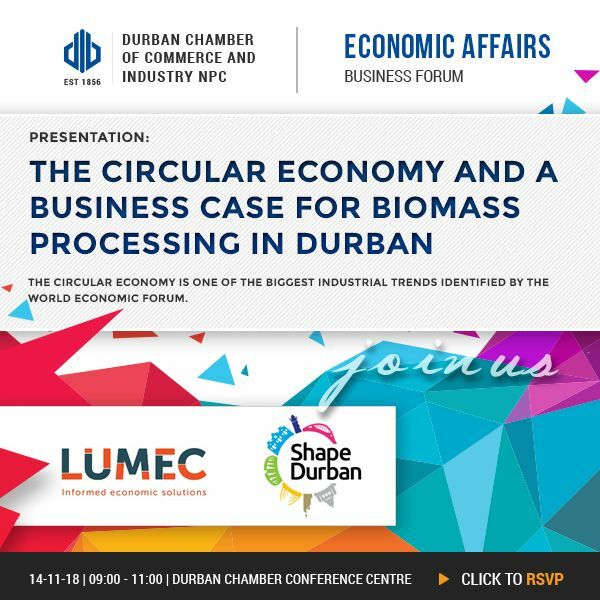 This presentation provides an overview of the circular economy concept and introduces an example of how the circular economy is being realised in Durban. The Shape Durban workshop will create a shared action plan for inclusive economic growth. Participating in this process means to work as a co-owner with the city and various other stakeholders towards influencing the future direction of the city. This approach, where we are "partnering for growth", will ensure that our shared action plan is co-created by a cross section of economic stakeholders and represents areas of consensus and collaboration that will move our economy forward.